Researchers identify previously unknown neural mechanism responsible for fat breakdown. White adipose tissue, or fat tissue, serves as a storage depot for energy-rich triglycerides. In times of need this lipid storage can be released as part of an adaptive response to the energy shortage. Adipose tissue mass is homeostatically controlled by an endocrine loop in which leptin acts on neural circuits in the hypothalamus and elsewhere in brain to regulate food intake and peripheral metabolism. It has been suggested that leptin also activates sympathetic nerves to white adipose tissue to increase the breakdown of fat. However, it is unclear as to how the brain signals back to the fat tissue to induce fat breakdown. Now, a study from researchers at Instituto Gulbenkian de Ciência and Rockefeller University has shown that fat tissue is innervated and that direct stimulation of neurons in fat is sufficient to induce fat breakdown. The team state that their results set up the stage for developing novel anti-obesity therapies. The opensource study is published in the journal Cell. Previous studies show that fat tissue constitutes 20 to 25% of human body weight being an energy storage container, in the form of triglycerides. Twenty years ago the team identified the hormone leptin, which is produced by fat cells in amounts that are proportional to the amount of fat, and informs the brain about how much fat is available in the body. Leptin functions as an ‘adipostat’ neuro-endocrine signal that preserves body’s fat mass in a relatively narrow range of variation. Low leptin levels increase appetite and lower basal metabolism, whereas high leptin levels blunt appetite and promote fat breakdown. However, until now it was largely unknown what circuits close the neuroendocrine loop, such that leptin action in the brain signals back to the fat. The current study combined a variety of techniques to functionally establish, for the first time, that white fat tissue is innervated. The lab dissected these nerve fibers from mouse fat, and using molecular markers identified these as sympathetic neurons. Ultra sensitive imaging was also used on the intact white fat tissue of a living mouse which showed that the fat cells can be encapsulated by these sympathetic neural terminals. Genetically engineered mice were then used to assess the functional relevance of these fat projecting neurons. The group used optogenetics to locally activate these sympathetic neurons in fat pads of mice, and observed fat breakdown and fat mass reduction. Results show that the local activation of these neurons, leads to the release of norepinephrine, a neurotransmitter, that triggers a cascade of signals in fat cells leading to fat hydrolysis. The lab conclude that without these neurons, leptin is unable to drive fat-breakdown. The team surmise that this result provides new hopes for treating central leptin resistance, a condition in which the brains of obese people are insensitive to leptin. They go on to add that these studies add an important new piece to the puzzle that enables leptin to induce fat loss. 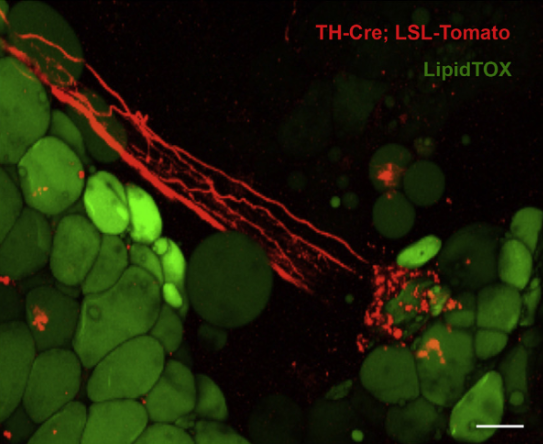 TH-Cre; LSLS-Tomato mouse; LipidTOX (green) labels adipocytes. Sympathetic Neuro-adipose Connections Mediate Leptin-Driven Lipolysis. Domingos et al 2015.